When we’re all done, we’ll have 21 trilogy shapes, each showing ratings for part 1, part 2 and part 3 of the series. 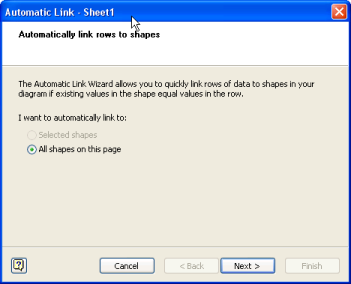 The first two articles in this series have already discussed the details of adding shape data fields to shapes, linking real data to shapes, and creating data graphics to show off the data. Today we’ll focus on handling large numbers of shapes and data records. Before we get too far down the road, we’ll need some images to work with. 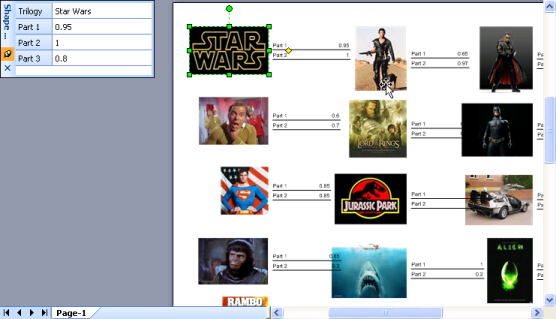 I simply went to Google, searched on each of the 21 trilogies listed in the Excel spreadsheet, and saved a thumbnail that I liked to my hard drive. After manually downloading twenty-one thumbnails from the web (phew! ), I wanted to import them into Visio. 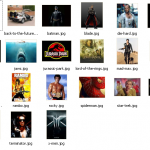 The trouble is, Insert > Picture > From File only allows you to select one blasted picture at a time! Since I’m a (half) developer, I just don’t have the patience for this, when there are ways to automate such drudgery. 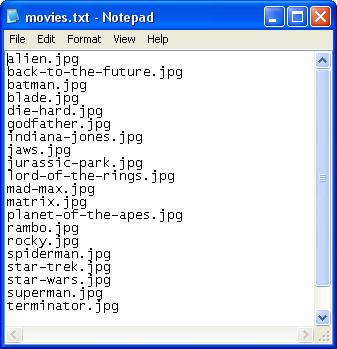 So the first thing I did was to automatically create a list of all the filenames for each image that was downloaded. I did this by creating a batch file called: dump names.bat. This file has only three lines in it, two of which you don’t need, but are there so that you can see what happened while the file is working. You can easily copy and paste this list, into, oh I don’t know, say a bit of VBA code that just might import all of the images into Visio for you! And here’s that bit of VBA code. You can see where I’ve pasted the file names at the beginning, then wrapped line-continuations and quote marks around each item so that I could quickly process them in an array. 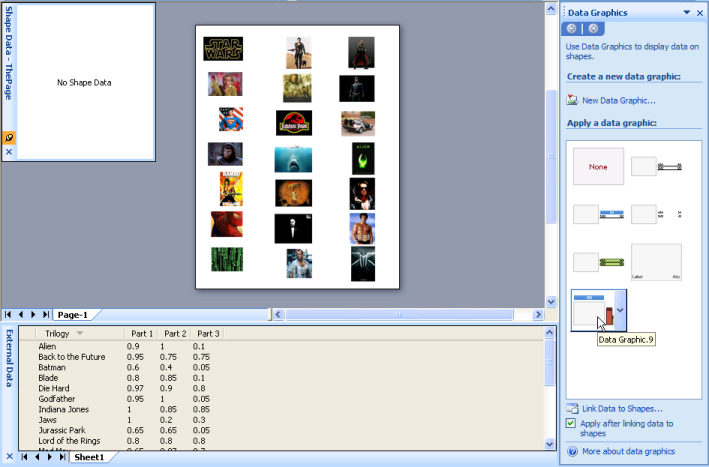 '// shape data field to each image. 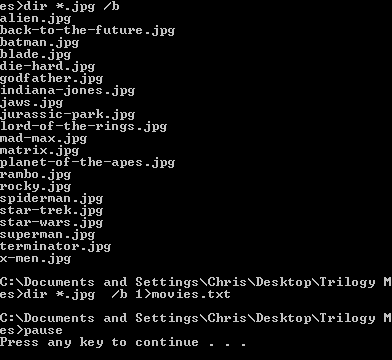 '// in the same directory as the image files. '// the first letter of each word. 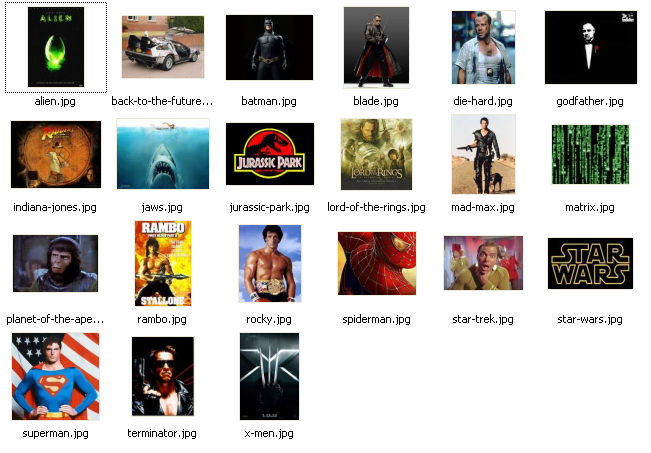 '// So, for example: "back-to-the-future.jpg"
If you use the batch file to create the list, then massage the list into the code above, you should be able to import a whole bunch of images lickity-split into Visio, and they will be ready to link to data and display data graphics, right away! 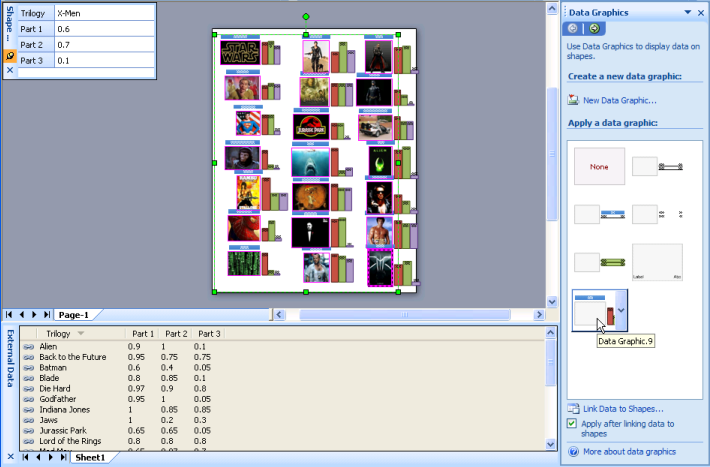 Sets the Value for the shape data field to a prettied-up version of the file name. If you don’t know much about using VBA code, and your head is spinning from the listing above, you might want to check out a few articles that will help to get you acquainted. First, have a look at John Goldsmith’s excellent “getting started” article: Just For Starters. Once you’re comfortable dabbling with VBA code and Visio, be sure to ease your peace of mind by educating yourself about VBA and security in: VBA Macro Security. 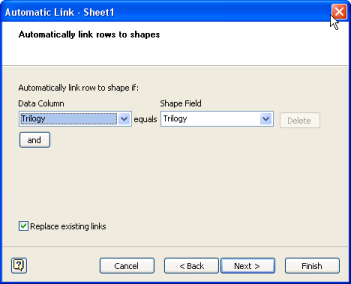 Why Only One Shape Data Field? You may have noticed that this time around, we’ve only added the “Trilogy” shape data field, but left the ratings fields out. We didn’t add Part 1, Part 2 and Part 3 like we did in the previous articles. 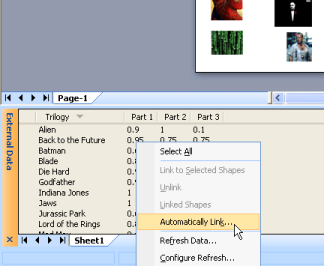 This is because Trilogy acts as a unique key into our database (the Excel file), and Visio has a way to help us link many shapes at once. Before we’re ready to link, there’s just a few more things we need to do. We’ve now got 21 shapes just itching to be linked to data, but before we do that, we’ll want to go get the data graphic we built in Trilogy-meter Data Graphics Part II so we can apply it to our shape. The easiest way to get a data graphic from one document into another is to simply drag a shape to which the data graphic is applied into the new document. 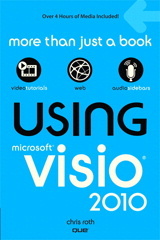 Visio will bring along the data graphic for the ride. If you’ve not done it already, we need to open the Excel file in Visio. You do this via Data > Link Data to Shapes, as discussed in the other articles. Finally we get to do the auto-linking. So go down to the External Data pane, right click and choose: Select All to highlight all of the records. 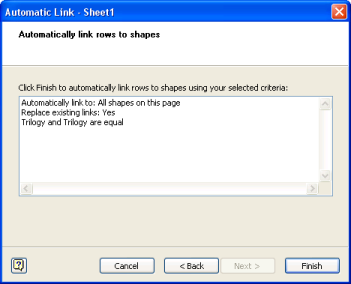 Visio will then present you with three dialogs to help in the auto-linking. Voila! We can see here that the shapes have all been populated with data. We’ve selected the Star Wars shape, and can see in the Shape Data window that it indeed has three new data fields for Part 1, 2 and 3, along with the corresponding numerical data. One way to keep Visio from applying the wrong data graphic is to delete all of the other “default” data graphics from the Data Graphics pane. Another way is to simply uncheck that box. Visio seems to try to use the last-applied data graphic as the default, but this would require you to first apply the data graphic to one shape in order to set a default. This seems kind of silly to me. I haven’t found any other way to specify which data graphic should be used in conjunction with our check-box, but if I do, I’ll be sure to let you know. 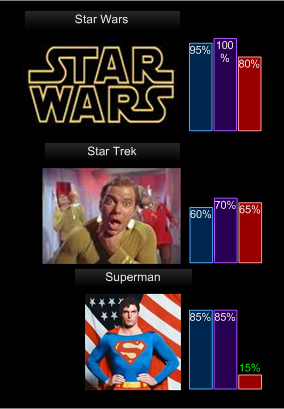 At any rate, it only takes a second to change the data graphic to our bar chart. Just select all of the image-shapes by drawing a selection net around them or pressing Ctrl+A, then click on our bar-chart data graphic. Presto, you’ve done it! 1) As long as you have to select all shapes and then apply the correct data graphic after doing the data linking — why not do it first and eliminate the application of the wrong one? To do so: a) Select All, b) apply the data graphic (nothing interesting will happen yet because the shapes don’t have data, but hang on for a moment), c) do the autolinking. 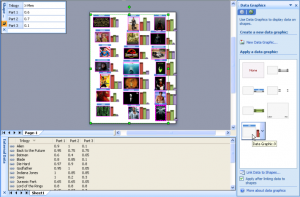 The result: the data graphics will appear as soon as data linking is finished. Of course, with another 6-8 lines of code you can even do the data linking automatically… maybe that should be the long anticipated fourth part of the trilogy!?!? But it seems to me that applying the data graphics before the auto linking will cause a problem, because the shapes don’t have all of the fields yet. The auto-linking actually adds the fields, so that they can then accept the data graphic properly. I’ll have to re-check this. Thanks for the tips, and anybody who submits code automatically gets an extra FIVE POINTS! Have a safe trip home (I arrived back in Boston a couple of hours ago).